Exhibitions on paper started in 2016 and is a continuation of our reflexion on the context of exhibitions and their mode of existence. We were busy running collectively an off-space in Geneva, Kiosk, and asked ourselves how to release from constraints linked with physical space while keeping doing shows. Exhibitions on paper became thus a curatorial and edition project. 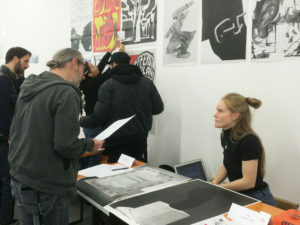 We invite artists to appropriate one of the faces of the poster, considered as an exhibition space. Each number has to answer to the previous one and features a unique proposal. The collection of double-sided posters, produced in series, aims conclusively to establish a dialogue between scheduled artists. 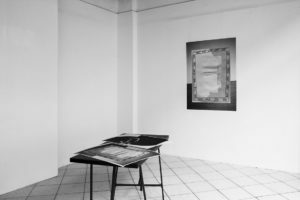 Through the format of the poster, the settings of the exhibition are played with: as an object, the limits become physical rather than temporal. Stamped with the data of each exhibition, the publications are a mediation space as well as an artist edition. Each number is produced in 100 exemplars, silk-screened, in Geneva. Exhibitions on paper n° 2 was launched in February 2018 at Lütz Studio, Leipzig, Facebook event here.